This quote came to mind as I participated in a five day kayak trip in the 10,000 islands area of Florida's Everglades National Park. I am a seasoned canoe paddler, either solo or partnered, but kayaking was a relatively new experience. I felt a little on that "edge." A kayak scares me. I took a class once and found myself end up - wedged between two rocks. The instructor came racing over and hit my kayak hard, and boom, I was upright. Kayaks are close to the water and tippy, and you are skirted in. The scary parts for me were handling the swells caused by passing boats and the good-sized waves whipped up by strong winds along side the incoming tide. Although anxious at times, I didn't turn over, and I really enjoyed myself. Once one gets into the rhythm of paddling it is really easy and relaxing. We paddled 6-7 miles every day and explored several islands all fronted with red mangrove trees. We set our tents up on sandy beaches, and hiked, swam, and bird watched in the afternoons. It was a perfect vacation. Is there something new you've been thinking of experiencing, but feel a little "edgy" about? Give it a try you might surprise yourself and add an exciting new activity to your life. On my Everglades' trip I ran into several senior volunteers. Working behind the counter in the Royal Palm gift shop was Betsy from Michigan. She was recovering from breast cancer, and her husband, Lawrence, was getting over a knee operation. They were looking for a peaceful setting in which to recuperate. They found it working as volunteers in Everglades National Park. While Betsy manned the gift shop 15 hours a week, Lawrence helped in vehicle maintenance. This paid for their lodging in a small park apartment where looking out their large picture window, they could view deer, great blue herons, and a multitude of wild life. Eventually they were offered jobs with the Park Service. Betsy became the buyer for the gift shop in addition to working part time there. Lawrence continued in maintenance. They decided that they liked Florida so much they bought a home in nearby Homestead. At Pine Key Campground, also in the Everglades, I ran into a couple of vagabond campground hosts. They had sold their home and all their belongings, bought an RV, and hit the road - never looking back. They traveled from one volunteer park job to another. Each morning they rode their golf cart to check in campers at Pine Key. Their next stop would be Yellowstone National Park, where they would volunteer for the summer. At Shark Valley, a wonderful 15 mile birding trail (with alligators!) where you could hike, ride a bike, or take the tram, I ran into Mandy. Mandy and her husband volunteered four days a week, eight hours a day for a minimum stay of four months. She received training in bird identification and habitats, as well as visitor services. We met her as she mingled with the crowd pointing out special birds. We might have missed a green heron sitting on its nest in the bushes without her assistance. They were given free RV space and electricity and had three days off a week to explore the area. Each park seems to have its own rules for volunteers so it is good to check. Information can be found on volunteer opportunities at nps.gov/volunteer/index.htm it is also possible to work for wages at park concessions. 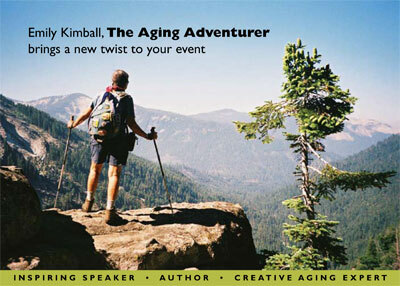 My booklet, A Resource Guide for Aging Adventurers which I sell for $12.60, lists lots of interesting volunteer opportunities here and abroad. Learn more about it at TheAgingAdventurer.com. You may remember the article in my last newsletter about life getting more tranquil as we age: less multi-tasking, fewer activities to choose between, less motivational conflict. I asked for feedback as to whether this describes your life. Marian Van Eck McCain, author and editor of the Elderwoman Newsletter, answered this way. "The persistence of 'motivational conflict' - oh boy, that is a big topic! I am still plagued by it. I can't decide whether it is a Bad Thing and part of the brainwashing of all those years of formal education followed by all those years in the workforce, or simply a function of my continued and deep involvement with life. I'll keep pondering that one...As I came to that piece of your newsletter, I said 'Ha!' out loud and when my husband, who was walking past, said 'What?' I started to read out your words to him about how our motivational conflict decreases with age. He hovered near me, twitchingly, for a couple of beats, and I realized that he wanted to hear what I was saying but was also in a hurry to be somewhere else. 'I'm sorry,' he said. 'It's just that I have all these e-mails to get through, you see...'"
Another reader, Bob Draben, responds this way: "I think I agree with its authors. I think that I do feel more tranquil as I age, at least I don't feel all the pressures that I felt a few years ago. Of course, like you, I don't feel entirely tranquil. When that happens I'll know that I am dead or about to be." In these hard times many seniors are considering working again. 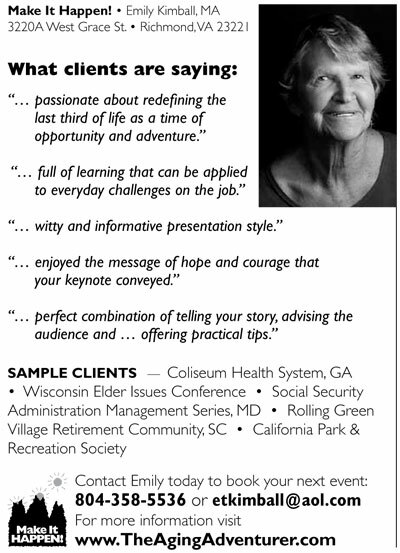 Jim Miller, author of The Savvy Senior books, offers these suggestions. Starting your own business? Get help from the U.S. Small Business Administration. It offers tips, tools, and free online courses you can access at sba.gov Also see bizstarters.com, a company that (for a fee) provides materials, coaching, and training to people over age 50 who want to strike out on their own. Or visit score.org for free business advice for entrepreneurs. Meeting with the local score people helped me to eliminate some options I'd been considering and put me on the road to more workable plans. Not sure of what kind of work you want? There are more than 3,000 Career One-Stop Centers around the country. These centers provide free resources and services to help people plan their next career, locate training, find a new job, and much more. Call 877-348-0502 to find a center near you, or servicelocator.org. Check out The Next Chapter, a service of Civic Ventures to help people nearing retirement figure out what's next. Visit civicventures.org/nextchapter. Try out a new profession by going to vocationvacations.com. This company lets you test drive different careers that interest you by matching you up with existing businesses. Currently they have two and three day immersions in more than 125 unique careers through 300 expert mentors. My Next Phase, a retirement counseling firm, provides a personality test as well as coaching, seminars, and web-based programs to help retirees find their passions. For details, visit mynextphase.com. Generation Touring Company is run by Jerry and Marian DiPieto of Nobleboro, Maine. It features tours specifically designed for grandparents and their grandchildren traveling together. A 2005 study showed 35 percent of grandparents taking one or more vacations with their grandchildren in the previous year, according to YPBR/Yankelovich Partner National Leisure Travel Monitor. While tours don't set age limits for kids, the best time for a grandchild appears to be 12 to 13 years old. Offered are nine day jaunts to Costa Rica to check out acrobatic monkeys and fabulously colored toucans. If baseball is to your liking, how about a tour of the sport's sacred grounds, a week-long trip to the National Baseball Hall of Fame in Cooperstown, New York, then on to Fenway Park in Boston. To check out other offerings and why this company feels grandparent-grandkid tours are so important go to generationstouring.com. Some specific titles are: Get Acquainted with the New Age Senior. Redefining Old Age for the 21st Century. It's Never Too Late to Make It Happen! Overcoming Obstacles to Achieve Your Goals: Life Lessons Learned from Long Distance Hiking. Stand Up to Ageism. Typical clients are area agencies on aging, retirement homes, hospitals and health centers, parks and recreation conferences, and business retreats.